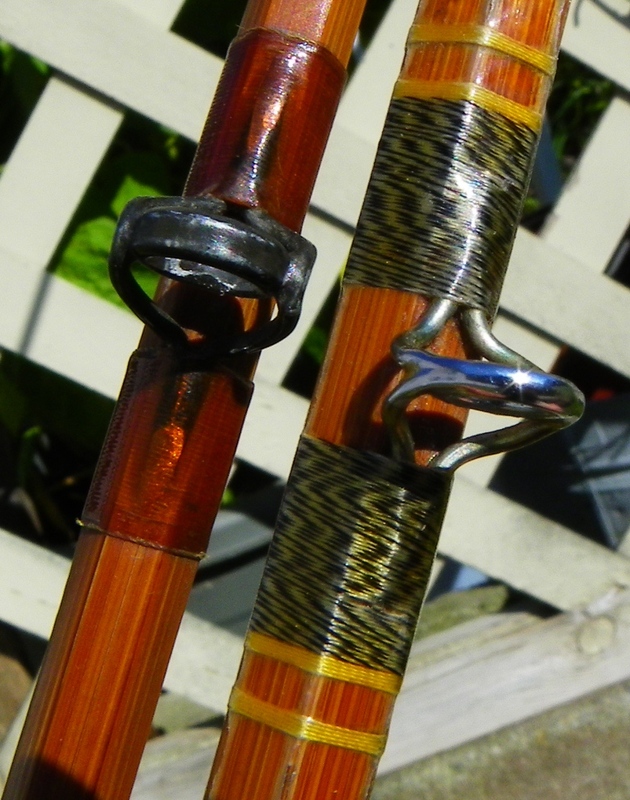 There are some very nice bamboo fly rods being made today, by craftspeople every bit as talented and innovative as famous rod builders of the past, but one of the things that attracts many anglers to old, used, bamboo fly rods is that they are old and have been used. The workmanship of the builder ensures their durability, and many rods made as far back as the early 1900s, or even earlier, still see service today. Part of the fascination they hold is the thought that they have stories to tell. How could a rod that has been fished for 50 or 75 or even 100 years not have stories to tell? Those old rods were once brand new and, like the anglers who cast them, they acquired their patina over time, little by little, cast by cast. Every outing adds another page to the story and this is one page near the beginning of one rod’s story. 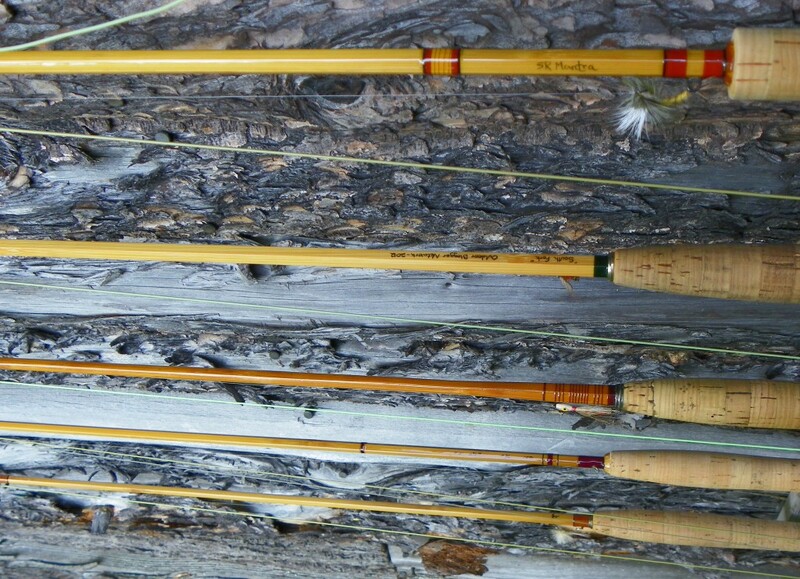 The Outdoor Blogger Network teamed up with Fall River Rods, Montana Fly Company and RIO Products this spring to put together a rig consisting of an 8ft, 2-piece, 5wt “South Fork” bamboo rod, Madison reel, and double taper, floating line to be fished by 15 far-flung anglers over the course of the season. 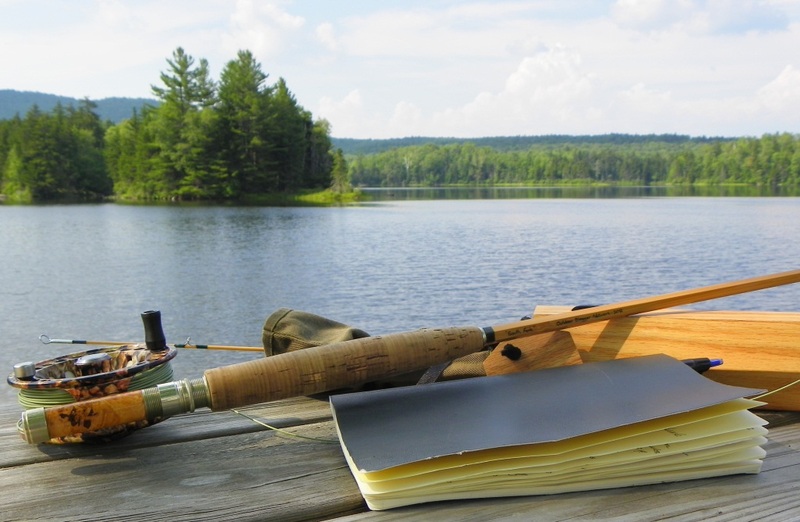 One of those 15 anglers will own the rod, reel, and line when all is said and done, along with an accompanying journal in which all 15 anglers will record their thoughts and experiences during their time with the rod. With a first season like that, the story of this brand new rod is off to a very good start. My time with the Fall River Rods “South Fork” is over. I’ve written my journal entry and sent the whole shebang on its way to the next lucky angler on the list. It’s a great rod to fish with and a lot of fun to cast but, as I discovered, some of the best qualities of bamboo shine brightest away from the water. 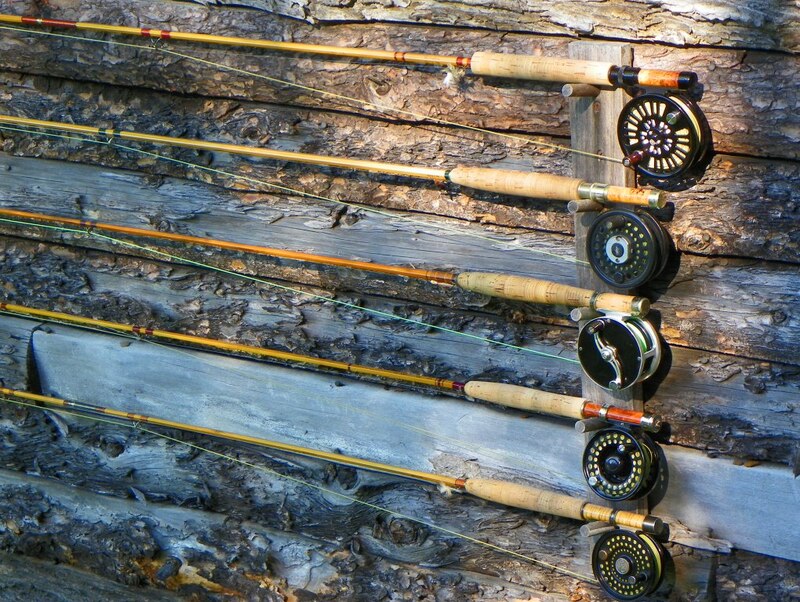 There is a nostalgia associated with bamboo fly rods, conjuring up images of days long past. Simpler times remembered, even by some who weren’t there, when our grandfathers were young bucks and “getting away from it all” really meant getting away from it all. Times when one could take off for a weekend of fishing in Vermont and not know until returning home on Sunday evening that one’s house had burned down. Times when, just as likely as not, one would be glad to have been fishing when it happened because there wouldn’t have been a darn thing one could have done if one had been home at the time. Bamboo rods, on the other hand, by their very nature, are unique individuals. Bamboo is a plant and each stem is different. Where synthetic rods are constructed of uniform sheets of fibers, wrapped around a mandrel and heated, bamboo rods are made from dried, split strips of plant material, with the characteristics of each stem creating its own feel and action. The weight, dimensions and taper of two bamboo rods may be identical, and each will perform admirably at its given tasks, but they will each go about it in a subtly different way. The Fall River Rods “South Fork” in this project is going to have a slightly different personality than each of its brothers and sisters built to the same specifications. The individuality of every rod is another attraction of bamboo. When I learned the OBN/Fall River rod was on its way to Vermont, I told a few other bamboo enthusiasts about it and they all expressed interest in giving it a try. In exchange, I asked them to each bring a rod or two so this brand new one could spend some time soaking up a bit of the tradition it continues. A bamboo love-bombing as it were, which turned out to be a real bamboopalooza. Mingling with rods built by people with names like Maurer, Jordan, and Klausmeyer, the Fall River “South Fork” became more like one of the gang than guest of honor, tossed gently placed in a boat for a few quick excursions to spots where there may or may not have been fish. Only amongst anglers does the phrase, “Here, grab my rod and give it a good shake” not turn heads. 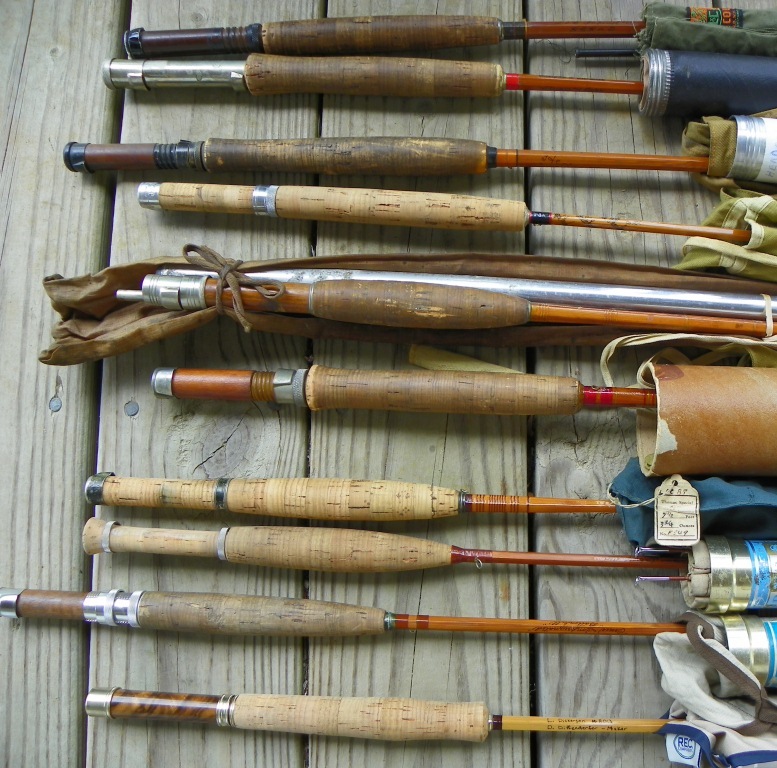 There was a lot of rod shaking going on as other rods appeared, from makers like Orvis, Wright and McGill, and Thomas. New rods from Sweetgrass and Becker also showed up, and a few unmarked rods found their way into the mix, too, adding a sense of mystery to the history laid out before us. By the end of the first week I spent with the OBN/Fall River rod, it had been fished alongside more than a dozen other bamboo rods and it became quite the topic of conversation around camp. It was fascinating to cast and compare that many bamboo rods in a short time, and the “grab bag” aspect of the whole thing made it even more interesting as adjustments were made to compensate for the differences between them. Some were very business-like, picking up and flinging line with grace and power, while others reflected whimsy and artistry, doing little dances as line slid through the guides. I exclaimed “What the …?” more than once as I felt the flexes and wiggles in my hand during a cast but, in spite of all the wiggles and flexes, flies flew true once I figured out the stroke. Even among different makers, synthetic rods start to feel the same to me, with all their built-in, engineered forgiveness. 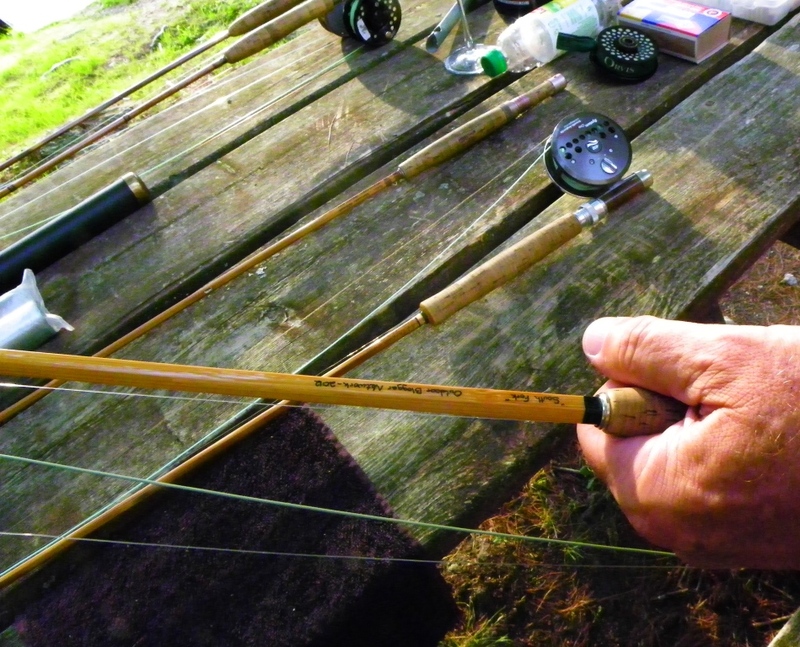 Bamboo rods require an angler to come to them, rather than the other way around. 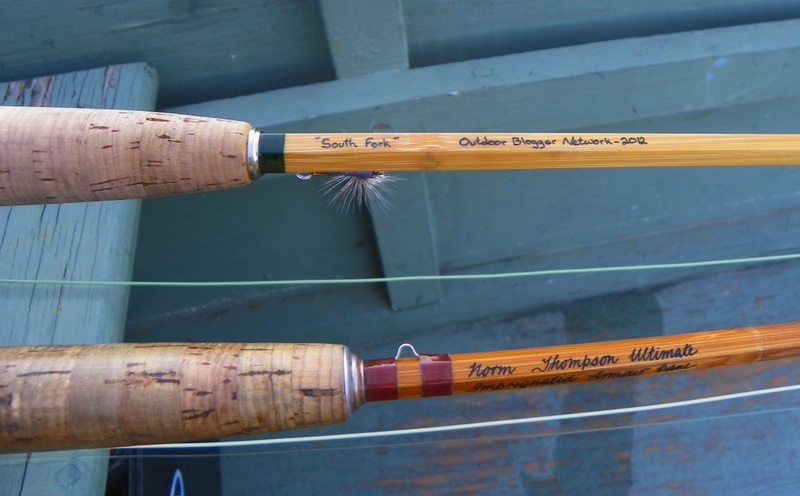 I was pleasantly surprised by the number of rods that showed up to welcome the OBN/Fall River rod into the world. In its time here it rubbed ferules and hung out with more than a dozen other bamboo rods and was fished by close to that many people, some of whom had never before cast a bamboo rod. Even more surprising to me, though, was seeing and hearing the conversations between anglers who knew each other only in passing, if at all. A bamboo rod brought them together, even if just for a few minutes, and in that short time they shared something in common — interest in and passion for our sport. The strength of bamboo lies in the long fibers in the layers nearest the surface of the cane. Vascular bundles, the circulatory system of the living plant, allow it to flex with the wind yet stand back up straight, again and again. A heavy hand during sanding can take them right off a rod before it is even built, and we refer to them by the highly scientific term “power fibers”. 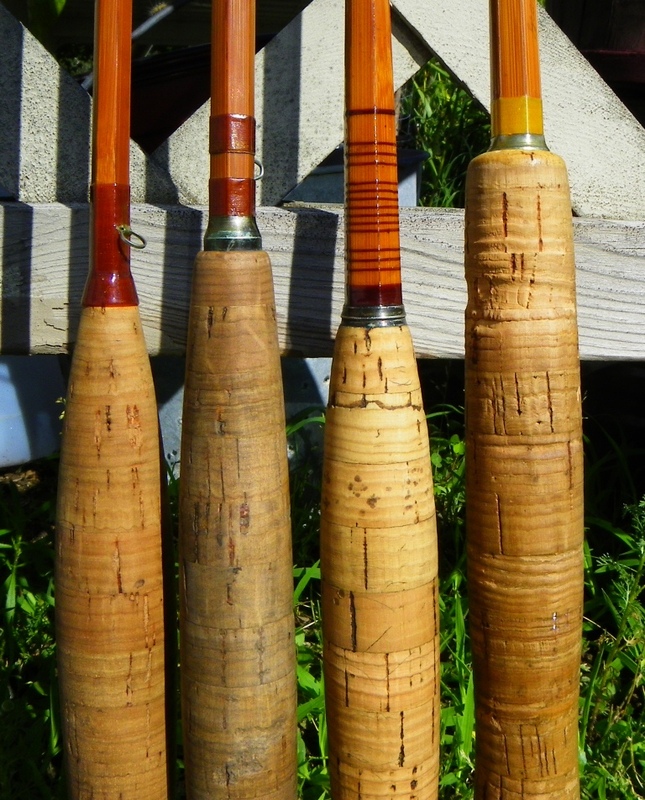 The choicest canes have these fibers in abundance and in the proper alignment, and good rod builders work with and around them to reproduce that flexing ability and take advantage of the slow, patient power they impart. One angler I know insists on nothing less than the fastest, lightest rods available, but within half a dozen tries he had the hang of casting the Fall River “South Fork”. Within half an hour he was seriously considering adding a bamboo rod to his arsenal. A twelve year old boy, who had caught his first trout on a fly rod just the day before slipped right into the rythym of bamboo, first with the “South Fork” and then with my heavy “Granger Deluxe”. He won’t be buying a bamboo rod any time soon, but his dad is sure giving it some serious thought. A couple of people remembered they might have an old bamboo rod tucked away somewhere, probably their grandfather’s, that they might just have to dig out now that they’ve seen and cast a few examples, and one friend I invited to share in this project went so far as to call in sick with a slight touch of Ebola (the kind that requires about 24 hours in Vermont to recover) to come play. I had the Fall River Rods “South Fork” for 11 days and originally offered to share it with just a few people. In that time I was handed more than a dozen rods to try. I saw casters of speedy synthetics having second thoughts. I saw someone take time off from work, drive a few hours and pay to stay a night, just to cast it, and I saw people who barely know each other chatting away like old pals. That, right there, might just be the true power of bamboo. Top to Bottom: Lyon & Coulson “Imperial”; Wright & McGill “Stream and Lake”; Heddon “Deluxe”; Hardy “Phantom” (never been fished); Mills & Son “Standard”; Pezon et Michel (from France); Thomas “Special”; Orvis impregnated “Midge”; Orvis impregnated “Battenkill”; Brand new “Dickerson Taper” made by Derrick Diffenderfer, an up and coming rod builder from New Hampshire. All because of the Outdoor Blogger Network and Jason Zicha at Fall River Rods. I thank them and my fellow 15 participants in the Great Rod Road Trip, along with Dave, Ray, Steve, Pete, Paul, Chip, and everyone else who brought bamboo to the party. And now, back to work. I’ve heard that some companies send their employees on retreats or hold events that include things like “trust-building exercises”. I have a similar program here, as illustrated below. 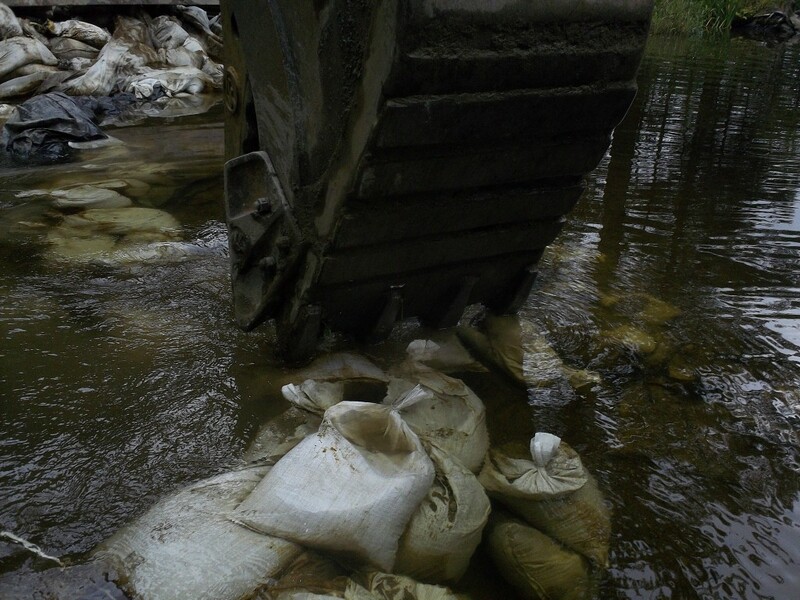 It is called trusting the equipment operator to not knock me out with the bucket or drown me as, 11 months later, we remedy the last of the lingering effects of Tropical Storm Irene. Get out and fish, people. I have only one thing to say: I’m envious. But I did this week, get to fish with a 60-plus year old Leonard Fairy Catskill bamboo rod, 7-ft, three-piece, that was a truly a joy to fish. And I caught a brown trout with it. 🙂 All in less than 15 minutes…thanks for sharing your bamboopalooza! Enjoyed it! That Leonard sounds really nice, Don. Maybe you’ll be around for the next one? The rod arrives by noon on Saturday, or so I was told. You’re historical tale is the complete opposite of the intro I’ve been writing in my head all week. I have no history with fishing or it’s traditions. I know virtually nothing about either. I just fish. I know you will add an interesting perspective to the mix. Knowing virtually nothing might be an asset. Paragraph 3, driest one in the whole bunch and one of the hardest to write. You may lift it but if you get the rod I get visiting rights. Nice to get the last of the big stuff from Irene put to bed. I think there’s only one more project involving swinging buckets this summer, and I don’t have to get in the hole for that one. Thanks Quill. Already put paragraph 3 to use. Just got done testing it out on the lawn. Oh my, my, my. This IS going to be fun. Dear Mr. Qiuill; Enjoyed your soliloquy on bamboo. We share mutual friends who have the same “addtiction”. While I’ve cast the “plant” and admit it has a”feel” not present in graphite I can’t quite bring myself to make the investment-yet! Hope to be in your neck of the woods in Sept. Maybe we can renew the discussion over some of that blackberry flavored “Old Stump Blower”. What a fun exercise… small stream rods to cannons! Thanks for hosting! A gentle reminder, your time with bamboo also included casts with an A. J. Thramer 8’6″ 3/2 pc, Freestone for 5/6 wt. It was the Thramer that freaked me out so much on the first cast. After that, it was fun. Thanks for playing, especially on short notice. We’ll do it again. Nice bamboo revival you had going there! I can’t wait to get my hands on her! I’ve liked bamboo rods since I first cast one but swore I wouldn’t collect them. I’ve got the bug now, especially after getting to fish with so many. I think the OBN/Fall River rod is going to be right up your alley. Thank you Quill for the history lessons and how cane becomes a common bond for many of us. As usual, a delight to read. Thanks. I’m really liking the way the OBN rod is creating bonds. I think grasping the grip on an old rod feels sometimes like shaking hands with everyone who ever fished it.